“The opportunity for students to test their gifts and to be mentored by seasoned pastors is truly invaluable," said Carmen Schrock-Hurst, instructor in the Bible and religion department and director of MIP at EMU. 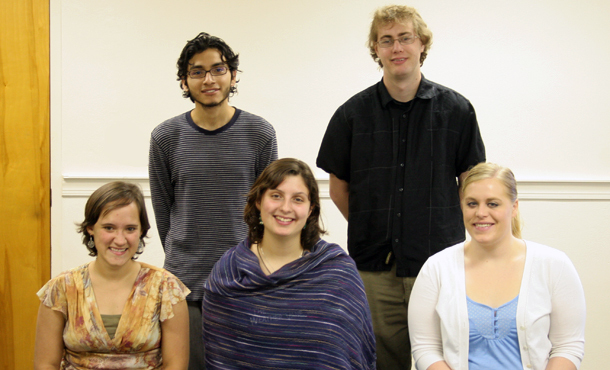 From left to right: (first row) Rose Jantzi, Rebekah Enns, Erika Bollman, (second row) Jossimar Diaz-Castro, Joel Nofziger. Photo by Mike Zucconi. A group of Eastern Mennonite University (EMU) students will begin summer internships with congregations throughout the U.S. as part of Mennonite Church USA‘s Ministry Inquiry Program (MIP). Funded in part by Mennonite Church USA, the MIP gives students an opportunity to explore their gifts for ministry and to test their possible calling to longer term service work for the church. “The opportunity for students to test their gifts and to be mentored by seasoned pastors is truly invaluable,” said Carmen Schrock-Hurst, instructor in the Bible and religion department and director of MIP at EMU. Erika Bollman, a second-year student in EMU’s Center for Justice and Peacebuilding and a member of Emmaus Christian Fellowship in Boise, Id., will intern at Philadelphia Praise Center in Philadelphia, Pa. Bollman will work with an inner city congregation that worships in three languages: English, Spanish and Indonesian. Jossimar Diaz-Castro, a junior philosophy and theology major and a member of the Early Church in Harrisonburg, Va., will intern with Iglesia Discipular Anabaptista in Harrisonburg. Diaz-Castro has the opportunity to “go deeper into the areas of teaching, preaching and working with the youth,” said Schrock-Hurst. Rebekah Enns, a junior history, peacebuilding and political studies major and member of River East Mennonite-Brethern Church in Winnipeg, Manitoba, will intern at Fourth Street Community Church in Washington, D.C. Enns will be working with the homeless population, providing meals and legal counseling. In addition, Enns will host youth groups from suburban Korean congregations who come to the city for an immersion experience. Rose Jantzi, a sophomore elementary education major and member of Iglesia Discipular Anabautista and Harrisonburg Mennonite Church, will intern with Highland Retreat in Bergton, Va., serving as staff chaplain and Christian nurture coordinator. Jantzi will be involved with pastoral care, teaching and worship planning with both staff and campers. Joel Nofziger, a junior history and peacebuilding major and member of Pilgrims Mennonite Church in Akron, Pa., will intern with the Washington Community Fellowship Center in Washington, D.C. Nofziger will be working with a multi-denominational evangelical congregation affiliated with the Virginia Conference of the Mennonite Church located near the Capitol. At the completion of their 11-week placement, students in the MIP program receive stipends towards their continuing education at a Mennonite college. In addition to Mennonite Church USA, funds come from EMU, the host congregation and conference, and the student’s sending congregation and conference. “The MIP program is a win-win for the denomination, local congregations, students, participating colleges and for the broader church,” said Schrock-Hurst. This summer, Mennonite Church USA anticipates having over 20 students in the MIP program from five Mennonite colleges participating in the program. For more information on the Ministry Inquiry Program visit emu.edu/bible/ministry-inquiry/.